Since September, Bitcoin Not Bombs has been fund raising for our #HoodieTheHomeless campaign, which is an entirely Bitcoin project. The fundraising is being done in Bitcoin, and the hoodies are being purchased with Bitcoin. No war dollars are exchanging hands. With the help of BitcoinStarter.com, CashIntoCoins.com, Amagi Metals, BitMit.net, Mass Appeal Inc, and the generosity of nearly 50 Bitcoin donors we were able to purchase over 150 hoodies which were ready to distribute on the eve of the first Congressional Bitcoin hearing. Sunday September 17th, Campaign Navigator Davi Barker joined Tom from Mad Bitcoins, Paige from Open Garden, and the dozens of volunteers from Project FEED in San Francisco to assemble and distribute 300 brown bag lunches, 500 toothbrushes donated by Global Grins, and the 150 Bitcoin Not Bombs hoodies. In addition every recipient of a hoodie, and many of the vendors at the farmer’s market that was going on, received our Bitcoin Quick Start Guide brochure. Project FEED is in it’s fifth year giving out brown bag lunches once a month in the Tenderloin. The typical quantity fluctuates anywhere from 200 to 2,000 meals based on the amount of donations and volunteers. We met at the Darussalam Mosque in San Francisco were we assembled the lunches, then volunteers broke into teams to distribute the lunches and hoodies. Even before we finished unloading the car a passerby spotted the box of Bitcoin brochures and asked for one. 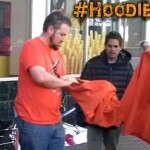 It turned out the man was homeless, so we offered him a hoodie as well. He said that he didn’t own any Bitcoin, but had heard a lot about it from a friend on the street, and was eager to learn more and get started. To whatever extent people imagine a technological barrier for people living on the street, it wasn’t hindering this man. 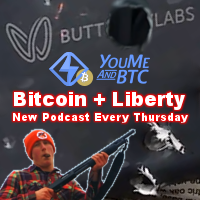 In addition to the simple goal of keeping people warm this Winter, and the general good PR for Bitcoin, another goal of this project is to explore potential interest in Bitcoin among the homeless population. Wired recently covered the trend of tech savvy homeless people utilizing free WiFi access to manage their Bitcoin finances online. Although we didn’t meet anyone who was already using Bitcoin, we did meet a few people who had heard of it, and even more who eagerly wanted to learn about it. One man in particular sticks out in my mind. His name was Doug, and although he’d never heard of it, the design of the hoodie interested him. After a brief explanation of what the digital currency was, his eyes lit up as he realized the potential. Of particular interest to him was the ability to manage an account from a smart phone, giving financial freedom to those who can not open legacy bank accounts. Some of the advantages of Bitcoin for homeless people are obvious. A major problem homeless people face is robbery. Having no home means having no security, which means it’s difficult to ever accumulate enough wealth to change their conditions. Bitcoin is uniquely difficult to physically steal. In addition the homeless outreach, we happened upon a farmer’s market in downtown San Francisco, so we took the opportunity to pass out our brochure to the merchants and talk to them about Bitcoin adoption. A merchant from Marshalls Farm Honey showed particular interest. Imagine the strength of a community were poor people were able to accept donations or work odd jobs for Bitcoin and then turn around and buy organic produce at their local farmer’s market. That would make it more difficult for the enemies of monetary freedom to characterize the currency and the community as solely concerned with illicit activities. But we’re not done. That was just the first batch. We’re currently fund raising for the second batch we intend to print in December, and #HoodieTheHomeless is potentially an annual campaign. Bitcoin is up! I bet it’s burning a digital hole in your encrypted pocket. You can help by buying a Bitcoin Not Bombs hoodie or tshirt for yourself or a loved one this holiday season. Each purchase is priced to cover the cost of a hoodie for a person in need.Here’s the details. In addition, you can donate Bitcoin directly to this campaign. All donations made to the Bitcoin Not Bombs general fund made during the course of this campaign will go toward this project. 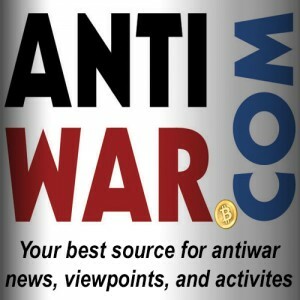 And CashIntoCoins.com allows users to buy Bitcoin by depositing war dollars at many popular banks and credit unions. Users can use the Bitcoin Not Bombs donation address to send Bitcoin to us, or donate part of the processing fee when they purchase their own Bitcoin.